A wireless network—simple really, buy a router, connect to modem, install CD, run set up, set up security, done. Connect to modem. Wait. My crappy cable modem provide by cable company? No port to connect wireless modem. So I could wait a week,and pay $ (a little every month for a rental fee) or go out today and spend $$ (not too much) and own my modem (and it will pay for itself in saved rental fees in less than a year) OK time to buy a modem. Well let's up grade the monitor— I have a flat screen on, and mounting hardware,just waiting for me to instal it. This will free up space for the new printer (which has a much bigger foot print) So it really has to be done first. OK, easy enough, I have the power cable and the USB cable for the new (not really new, just new to me) monitor. I can disconnect power cord and monitor cable from old monitor, and get that done. No I can't! The monitor cable is hard wired into the old monitor, and I went through my bag of goodies—and found –lots of stuff (even a old scusi cable) but a monitor cable? No. So I am 2 for 2 for failing! Fortunately Staples is near by—and I can pick the cable and cable modem up later today. I still have to drill a hole in the desk top for the bracket to mount the monitor, and I will (I think) also drill a BIG hole to route the wires more neatly—or if not neat, out of sight!) I have the drill bit even and a plastic cap to plug the hole, and and all the split flex tubing I need. and baggie full of try wraps--everything I need to to do the job-- but it's the last step--not the first one! So for now, the desk top (and underneath!) is neater and cleaner—but its all the same old stuff. It's so simple to upgrade—except when it's not! So I was talked into waiting on buying a wireless router—but time is up! I've wanted a to go wireless for awhile—and now have an extra incentive. I am moving—belatedly—but better late than never-- into the new, wifi always on line world. Just another thing to be thankful for! And since Saturday is for sewing—yesterday it got itself a nice little envelope to hold it. 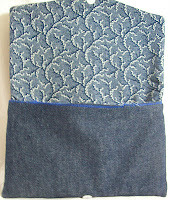 Inside (between the layer) there is plush iron in interfacing—giving the envelop a bit of padded protection. A small Velcro dot holds it closed— enough I think. A pocket on back will allow me to carry the charger, too—since with only 6 hours of battery life-it need to be fed often. And while it doesn't really fit, I will the manual tucked into the envelop, too. (The manual has bigger exterior dimensions than the tablet-but barely 20 pages thick, so it can be crammed into the envelop and folded over a bit)--I don't plan on carrying the manual long term--and decided that the envelop should fit the tablet--not the manual. For now, I still need the manual handy to reference some paths—but already in 24 of playing with it—I feel like I know my way around. It will get a try out this afternoon—Sunday means knitting at Panera's—and Panera's will have wifi. I think I am going to need to find some sort of Droid manual too--I have figure out how to connect it to my computer in the most basic way. But not how to communicate with it. It seems like it should be able to talk to my Google account and let me exchange and sync info with a hard wired connection (but I haven't found out how yet!) I am sure there are thousand of other users who will show me around. Another system to learn! My first hand held computer was a 8086/dos based Psion (circa 1995) then a Palm Pilot, (and an upgraded Palm) and then for the past few years, nothing. 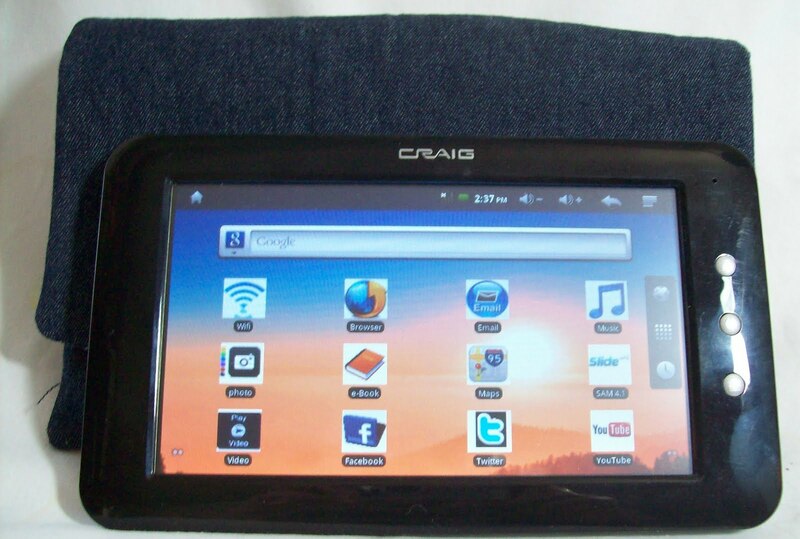 For now, a low grade tablet—and for Christmas (I have been a good girl) a new smart phone--(also android based!) —by then, I should be, if not a wiz at Android –at least proficient--a full fledged member of this century's technology--(and not a dinosaur left in the last one). I love to knit—my knitting is a reminder, that: this too, shall pass. 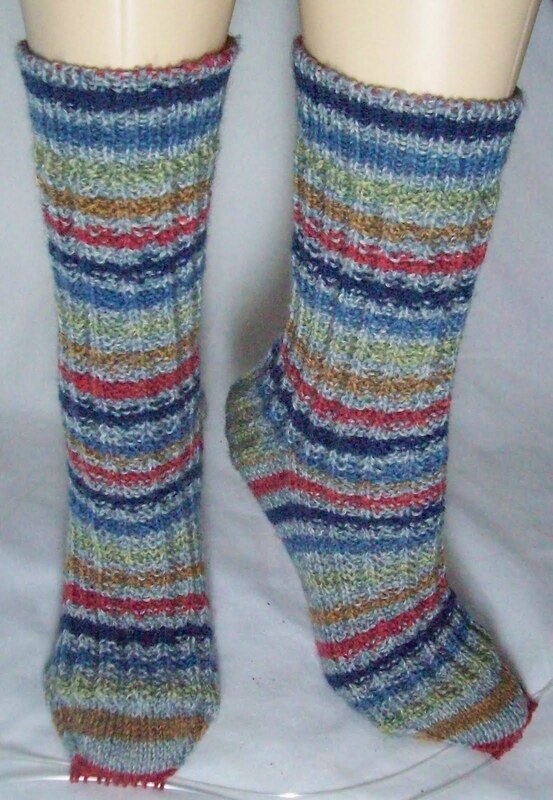 These socks (LOOK, progress has been made while I haven't been blogging about it!) are all three. I started them earlier this month when some health issues were not going well—and they served, one Monday a few weeks ago, as a tool to keep me from emotionally falling apart--there were cracks at the seams--but in the end, I held together. And they remain mute evidence to my precarious state of well being. 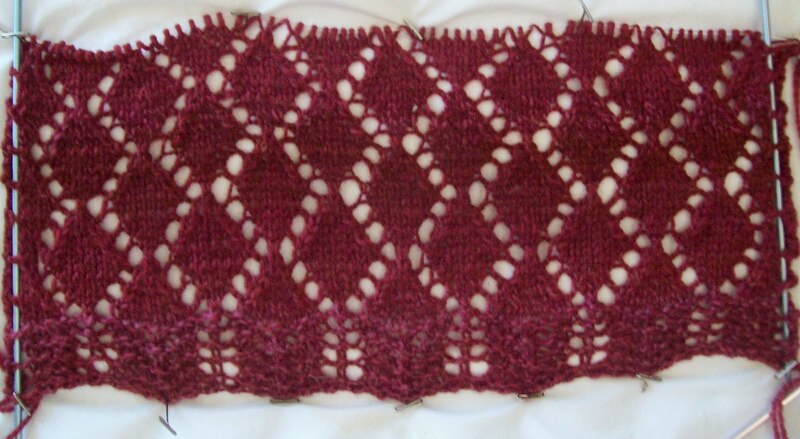 I had an idea (originally they were going to be a floral lace—but that idea was pushed aside for a simpler pattern of twisted, (each knit stitch is twisted) cabled pairs. I figured out the grouping of stitches on a scrap of waste paper (actually a bit of light cardboard as found in magazines for subscriptions—exactly that!) and set to work. The first pattern repeat? Well, its really patternless. I had an idea, but I couldn't think straight—and there really is no design. Just a mismash of some simple cables. But the act of knitting did its magic and by the time it came to do a second repeat, a real organized pattern emerged—gone were the chaotic, disorganized thoughts, and gone were the chaotic disorganized stitches. The two repeats since then are just as organized—but a secondary problem(?) --well not so much a problem, but an after effect—the pattern I worked out for the instep works fine—but well I didn't want a full repeat on the back of the sock (because then there would be two sets of lace with out any purl ditches between them at the side (seam)) and there were too many stitches to drop one column of the lace and too few to have 2 sets of the cable element. Poor Planning on my part! So the back is plain. Not the best choice—but it's OK. I normally would plan better—but on the day I planned these socks I wasn't thinking well enough to do a better job. And they are not so bad that I would even think to frog them. No, they will be as they are, patterned on front, plain and back. A bit of history. A knit reminder to myself. The socks could be better—but it doesn't matter that they aren't—I AM. Now back to the laundry that I have talked about doing for 2 weeks now (early this week the laundry room was closed 2 days for repairs—so the delay is not just procrastination on my part!) There are 4 load washing--1 complete load is nothing but socks! Soon all the load will be drying. Then for next week, 2 more loads of stuff to do (still left in the hamper)! I have this bad habit of wearing clean clothes every day—and using towels and sheets, and Oh how the laundry piles up! And I have so much to be thankful for—not the least of which is all of you my readers. Is just about the right size for me, sans the heel. In a round or two it will time to start the heel--a short row heel--which will add about another 2 inches—and I'll have the 9 inches of sock I need to fit. I am going to momentarily pause work on these socks then. 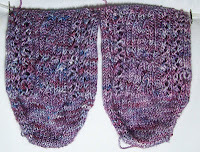 My friend Debbie is working on her 2nd pair of socks—and I want her to see a short row in progress. She is a very visual learner. 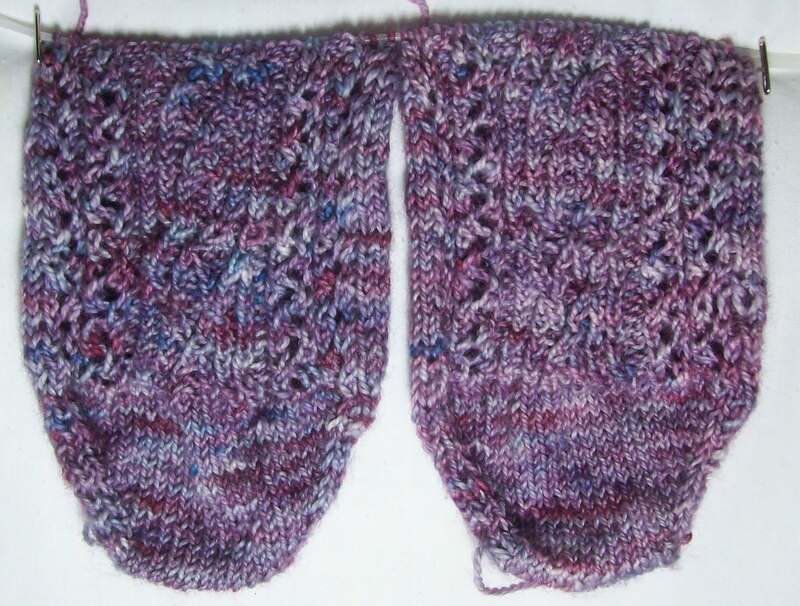 She's now started on her second pair of socks—and will be doing a short row heel in a few weeks. She finally finished her first pair of socks last week—Not quite 6 months in the making—and while they are not perfect(far from it!) She is pleased as punch with them and has already worn them. I'll nag her a bit, and make her take a photo—but, already, her second pair are looking so much better! I'll see her Sunday, at Panera's—and I want to be mid heel at then. 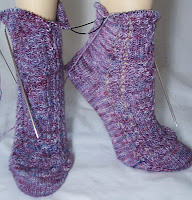 Then she can see a few short rows being work, and also see how to pick up and do the second half the the heel. 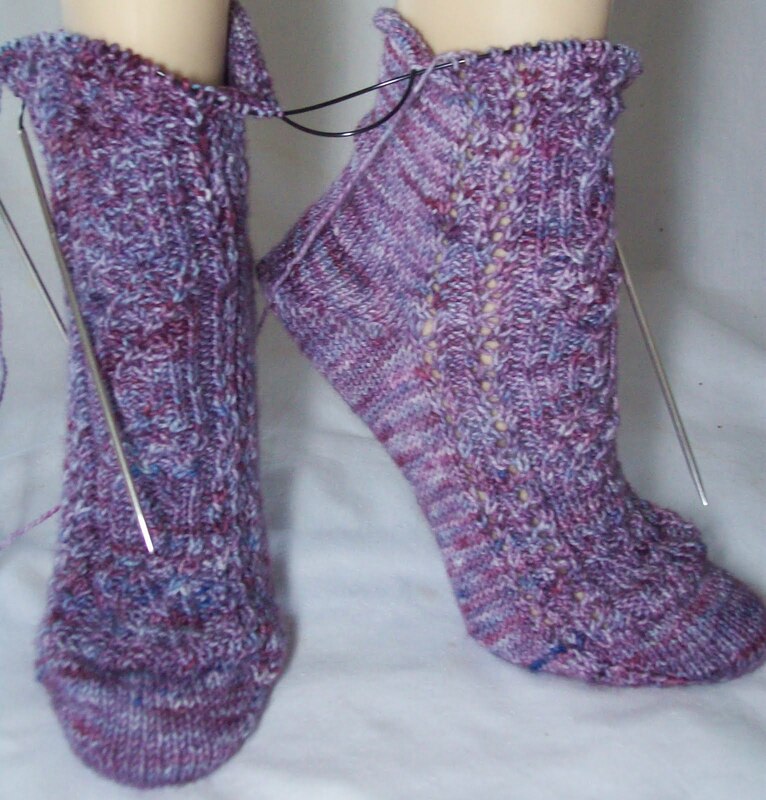 So a few more rounds, and I'll start the heel, then, pause before finishing the first half. 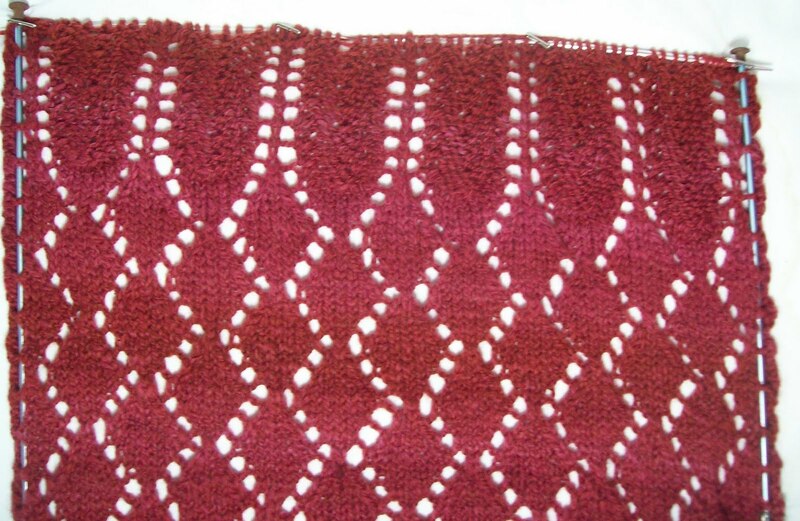 But—before that—as promised, here are the socks stretch out and semi blocked—Now you can see the center pattern of twisted stitches that cable back and forth to make intersecting diamonds—do you sense a recurring theme here? It could be! 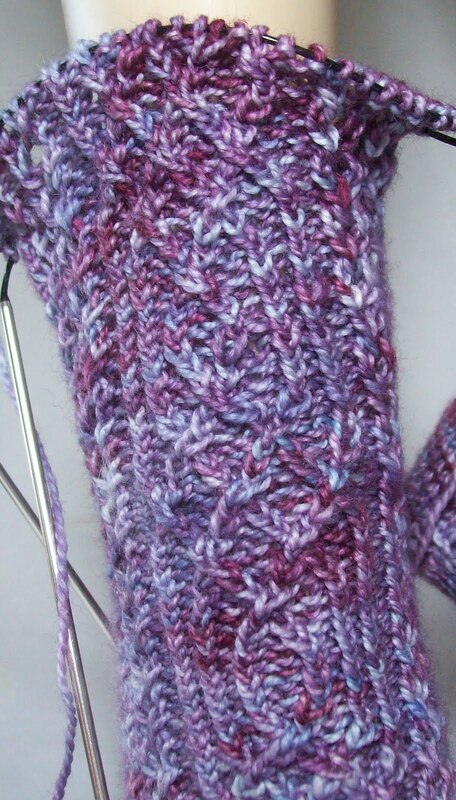 The gloves are likely to have yet another iteration of a diamond pattern –one done in knits and purls. I find I often repeat a design element over and over (till I grow bored with it)--This month its Diamonds—who know what will be next! So in the mean while, I'll cast on the fingers of my gloves—and start to work on them. I have the yarn and needle ready--and I need to finish them before the Christmas holidays anyway--so it's not too soon to get started. 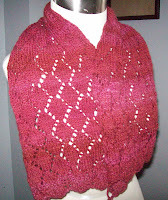 Dry and unpinned from the blocking board, the Red Diamond's scarf is more like a small shawl than a scarf! I am pleased as punch with FO. It was qick to knit, (I finished long before I was bored), it's as soft as all get out, and now, finished, it's bigger and prettier than I expected. 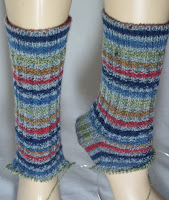 As for the socks—working well rested, and with no anexity, it's much easier to formulate a pretty, but simple pattern for the twisted pairs of knits and purls. The pattern takes a bit of time—but I think its worth it—see—the are beginning to look quite pretty. Next time I photograph them, I'll stretch them (or put them on LEGS), so the pattern is easier to see. The yarn is also merino--home dyed to create a hand painted effect--there are at places, (not this part of the skein) more blues in the mix--but all in all I like the look. OK, that's it—I have done a ton of stuff already this morning, and have a ton more to do—So I am off! A few weeks ago, I finally got around to buying some Styrofoam insulation panels—a set of 6, each 15 inches by 46 inches with tongue and groove edges—so they can snap together for larger panels.--I can get long and narrow shapes for long scarves, and square shapes for sweaters, and even giant stepped triangles for shawls.. I have a ton of knitting that needed something longer than my couch, and more convenient than my bed—so these panels (each about 1 inch thick) are, for me, the perfect solution--they store readily, out of the way under the couch. (I didn't actually remove the plastic overwrap this first time—the plastic is the source of the reflected glare!). The price was right, too--the set of 6 cost less than $10. The color in this image is pretty true—or it is at least on my monitor--it's a little darker, now, damp, than it is dry, but its just about right. Today is the first time I am using them—with very little tension, the scarf is being block to a full 46 inches! 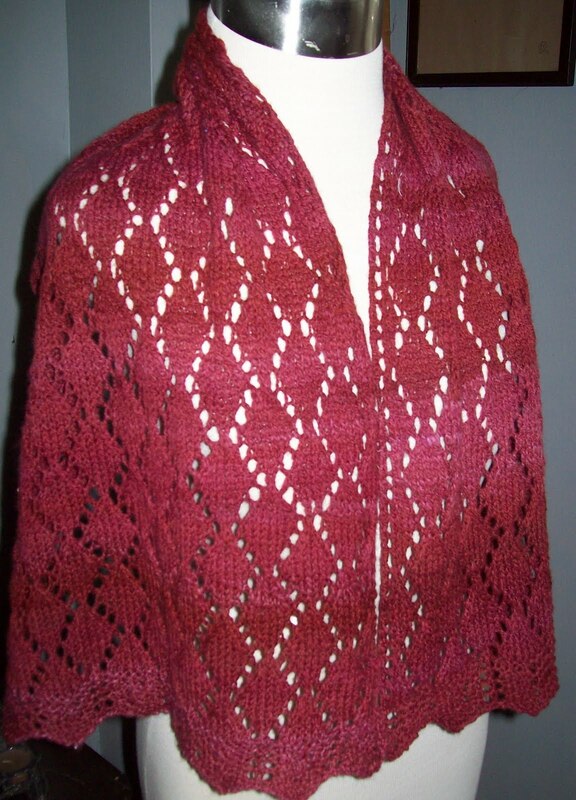 I didn't thread the blocking wire in the chevron ribbed center back—I want that part of the knitting to fold up accordion style—seeing it 'scooped in' at the neck looks perfect! I can't readily get the whole scarf in a single image--well maybe from 10 feet away I could, but then the light wouldn't be as good, and the details would be lost. No matter really--since each end is a mirror image, seeing one end is the same as seeing the other! Tomorrow AM is yet another Dr's appointment--(but it should be a quick in and out! ); when I return, (before noon with any luck at all!) it should be dry and ready to unpin. Then, I'll drape it on my dress form again for a finished photo. This was yesterdays post—that never got photos or posted. But not quite finished (still ends to weave in) and not blocked. But it looks good—and unblocked its 34 inches long—not bad, not bad at all. 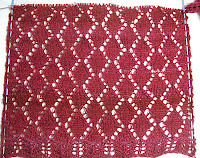 Blocking will add a few inches—but not to much since I don't plan to hard block it. Yesterday (Monday) was a lost day—I got a lot things done, that needed to be done—but it took hours, (boring, and TMI health stuff)—Fortunately, I had knitting with me. I was able to while away a few of the many hours involved, knitting. Socks that were nothing more than a cast on and a round are now looking like this—the pattern is going to be problematic—this first repeat is free hand—and I'll have to think about what I did, and when to repeat it.. Or come up with something similar and chart it! (I am not obsessive) –I can have a pattern break and be different –especially if its going to be hidden in the toe of most of my shoes! 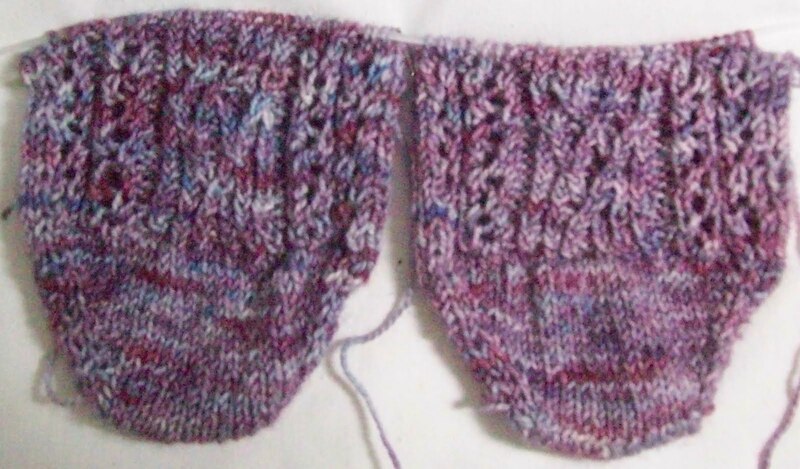 I could have even knit more—but I need to rest my hands and take a break—still it's a nice start to a pair of socks! But knitting is going to take a hit—ever behind the curve when it comes to fiction reading, I just got The Girl with the Dragon Tattoo—and well, this book (and the next two in the series !) are seriously going to cut into my knitting time. Since yesterday, all I did was add a few (6? maybe, if that) to the socks—I still haven't finished the scarf or blocked it. But I did get photo's taken--and this bit posted! Every day—I am not quite as recovered as I think. Thursday I was addled, and tired, and yesterday I felt fine—till I took out some garbage—and got chilled to the bone. A hot drink (decaf coffee) didn't help—instead I crawled under a pile of warm blankets, and took a nap. That did help—no laundry got done--(there are worse things) but after my nap, (and dinner) some knitting did get done—There is just a bit over 6 inches of lacy ribbing now—and just a little bit of yarn left—2 inches worth? 3 inches worth? (I hope so, but I doubt it)--what ever the measure, the end is in sight for this scarf. 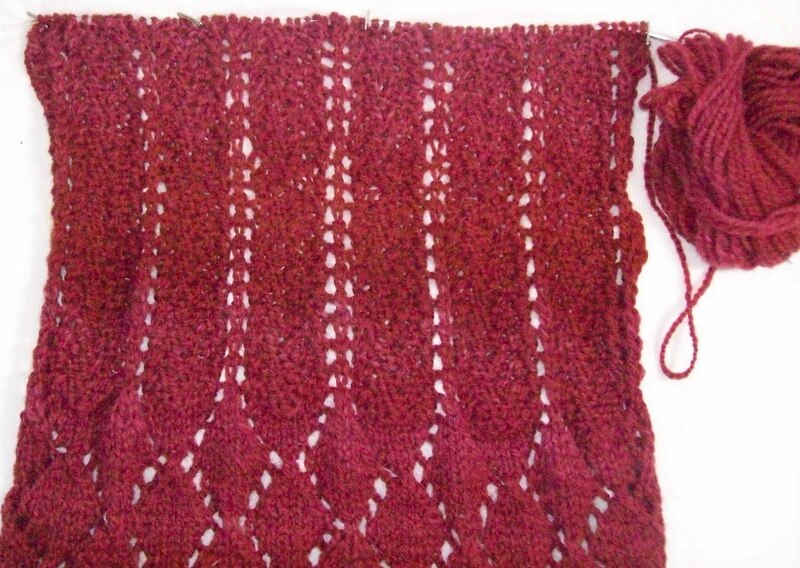 2 pieces of lace –each about 14 inches equals 28 inches, plus another 8 (maybe 9?) inches of ribbing at the back of neck—that's 36 inches in total. Not bad—Just about right for an inside the coat/jacket scarf. 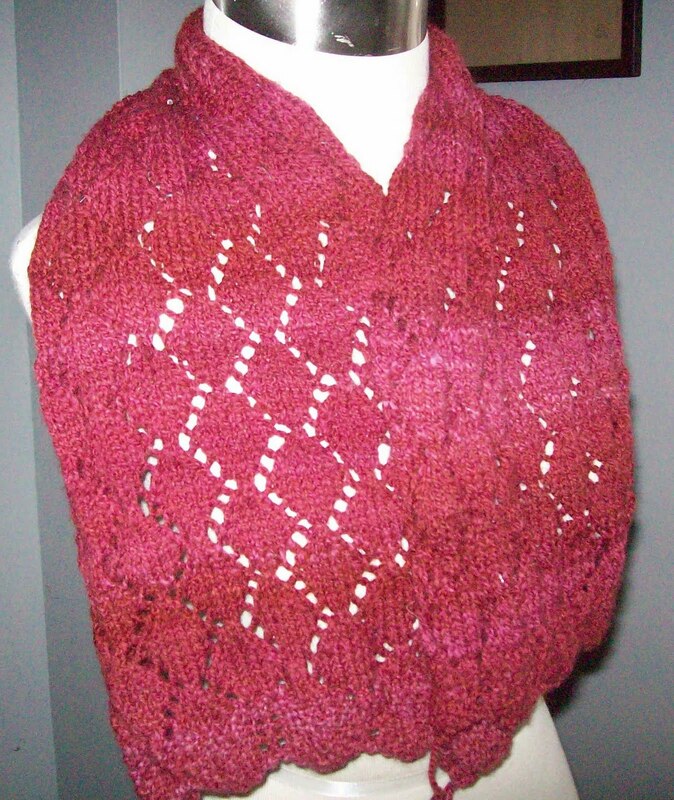 And it's so pretty, and so soft—and even with the set backs—so fast to knit! Today is Saturday, so the first order of business will be finishing the skirt (Saturday is for sewing!) but come the evening, I'll be knitting—and will finish the knitting--I might not finish the scarf—I could end up grafting tomorrow at Panera's on Sunday. And even after I finish it (weave in the ends!) I will still have to block it. So it's really still has a good deal of work to be done before is really all done. Then it's glove (and sock!) time—I think I will work the two projects at the same time. One thing about socks—there are almost never ends to weave in—and they are knit and go—no blocking required not even for this next pair-- which will be lacy. Almost nothing knit on the scarf--Well actual a number of rows knit—and frogged, and re knit again,and frogged again—with a net gain of just a half a dozen rows! I was was tired—more tired than I realized (fell asleep before the evening news!) and kept making stupid mistakes--like forgetting to decrease, or knitting the purls or purling the knits!-I should have realized I was too tired to knit! And while progress was made on the skirt yesterday afternoon, —the bits and pieces had edges bound, the pockets got sewn in (side) and on (back)--and top stitching details were added, the zipper got put in and the waist band started, (but not finished). All in all, a lot of work got done--but it's not quite finished, yet. Left to sew is the inside waist band, and the hem, plus details like the hook and eye closure for the waist band. Maybe an hours worth of work—that I can easily complete tomorrow and have the skirt ready for Sunday. I think I'll leave it for Saturday sewing. I have some other projects to sew up tomorrow—little ones—and maybe I'll get another skirt (a smaller sized one!) cut and ready to sew. So that's it.. Simple stuff. Work done, but not really much of anything! I look at my wound every day, and see, every day, that is getting smaller and healthier looking—but yesterday I had proof that I (as a total person!) am getting better. Yesterday was a frustrating waste of time, money (OK, just $10 or so, but $1o is a lot of money when you are out of work!) and energy—and while I was annoyed—I wasn't done in. A few weeks ago–3 to be precise—a day like yesterday would have had me in tears—not for long—but I would (I did!) find I had no reserve of patience to deal with even minor set backs. Now, they piss me off, but I take them in stride. And I can even find joy in little things, and be happy in the evening after a rotten start to the day. I started off noticing—I had messed up (in a very minor way) my lace scarf. 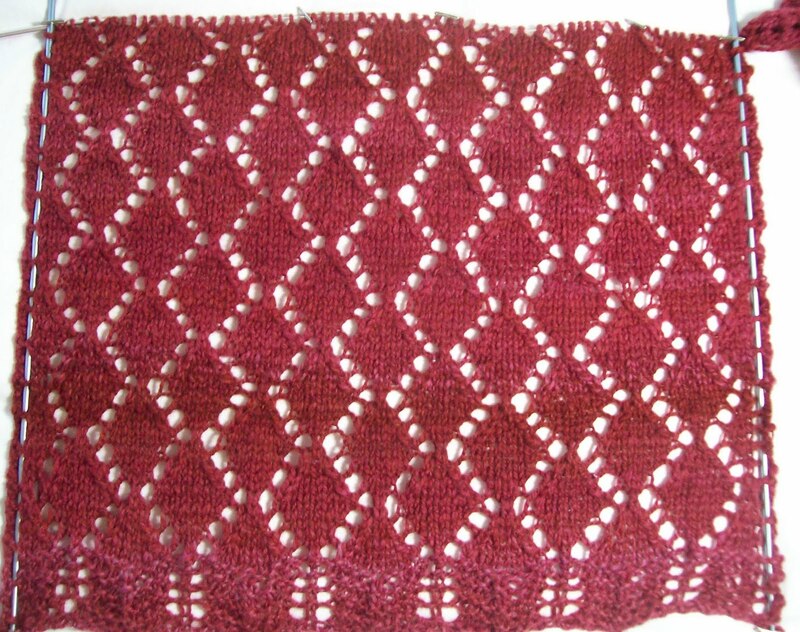 Instead of working both halves every row—I found I was half a pattern repeat (6 rows!) out of sync!--An easy fix—but really, where was my head at!? Each end is a bit over 12 inches long now—and while the smaller of the two balls is pretty limp, I think I still have enough yarn to do yet one more pattern repeat, before starting the lacy rib pattern for the back of the neck. This is going to be a nice size scarf—which makes me happy! I am still not sure I like the color—It's a lovely cranberry red, but cranberry red is just not a color that sends me. But I love the yarn, and I love the how the pattern is working out—and I love how the overall length is going to work out too! I love winter squash—just about all of them—but unless you go to the farmers market—the selection of choices is often pretty sparse—you have your acorn and your butternut—and that's about it. The best fruit and veggie stand (which is also 6 blocks away and the other side of Queens Blvd (aka boulavard of death!)) 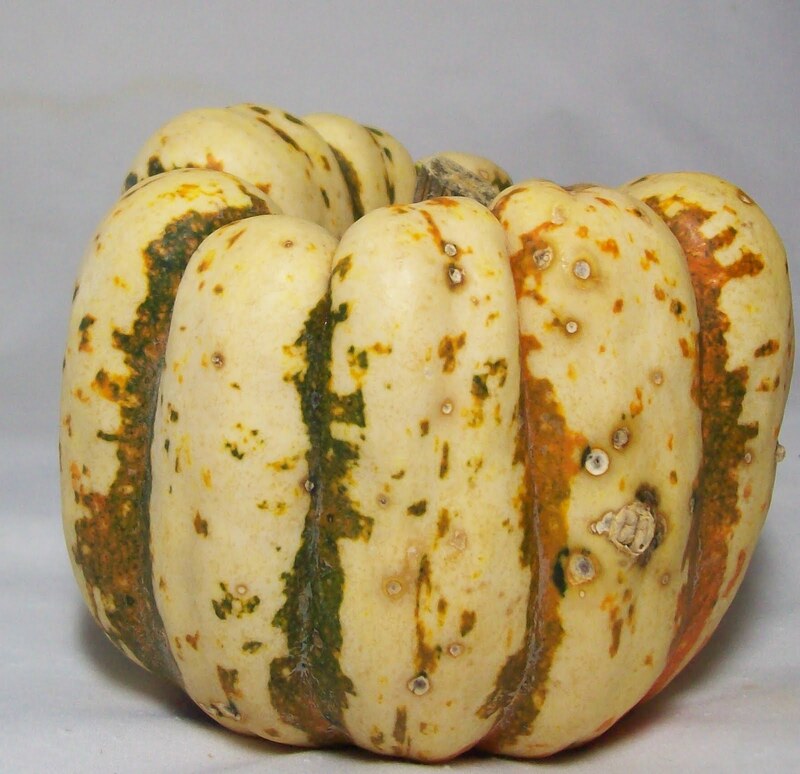 some times has some other squashes—but last time I went there—looking for a spaghetti squash—I came home empty handed. Well, no, not really empty handed-- I came home with several pounds of fruits and veggies (that grew heavier and heavier with each passing block )--just with out the one thing I wanted to buy! 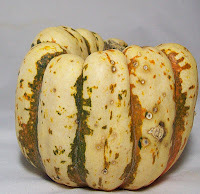 I'll try again tomorrow-- I still want a spaghetti squash!--and maybe I'll find some thing else interesting. Heading out in a few minutes—will be gone all morning and a bit of the afternoon. After that, turn round, and head west—and go from one end of Queens to the other (from 230th Street (apx) in eastern queens to 11th Street in western Queens—thankfully, while there are some who reverse commute—traffic will be heavy—there aren't so many—so it will be moving. Evening will find me at Tuesday night knitting. I am going to pass on delivering the CSA veggies till Wednesday morning. My daughter won't be home (to come down to the car and get them) –and road work makes it impossible to park at night. It will be cool (in the 40°'s)enough that the veggies (likely to be a bunch of root stock!) and they will be fine in the car trunk over night. Well I got some knitting done yesterday –(not much, but some) and will, get some done this AM, and some more this PM, and should have something to show tomorrow. Now there are 9 inches of lace (and the once plump balls of yarn are hollowing out)—I can do another inch or two before I begin to get nervous—then I'll change the stitch pattern to a simpler, open lace (a much more open lace) for the back of the neck—All the fancy lace up front—and something easy to bunch up for the back of the neck. The result will end up being an ascot style scarf—with soft open lace in the back will scrunch up nicely (who needs 12 inches of fabric at the back of the neck?) 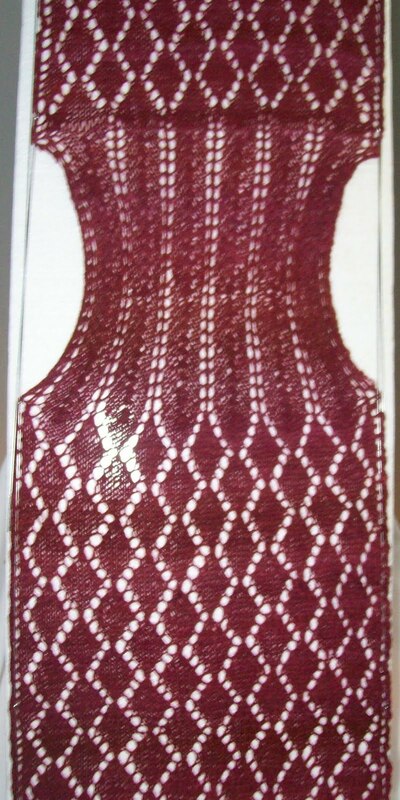 Front ends--the diamond lace-- will fall flatter, across the front of the neck upper chest-- Nicely filling in the opening of coat neck line. A showy front, and simpler back. This photo shows the variations of color that exist in the wool—but the previous photo's are closer to the actual color (this image was lit with a Ott type light) Amazingly-- the light to dark and dark to light gradiations are very similar on each piece—Not perfectly matched.. but balanced. This has really been a quick knitting scarf—I think I'll be done before I have a chance to get bored! PS--D finished up her socks, and I grafted the toes of mine too! The yarn is super soft and squishy—it's a dream to knit, and the scarf will be a joy to wear. I have no idea how big it will end up being (before blocking or after!) but 300 or so yards is enough to make a decent length. Scarves are pretty flexable when it comes to length! I have no need for another scarf, needless to say—but then again—I have no need for more socks, but I plan to continue knitting them too! I got some sewing done, too. I finished up a skirt that I started last year (that was too tight in the waist—but now fits!) 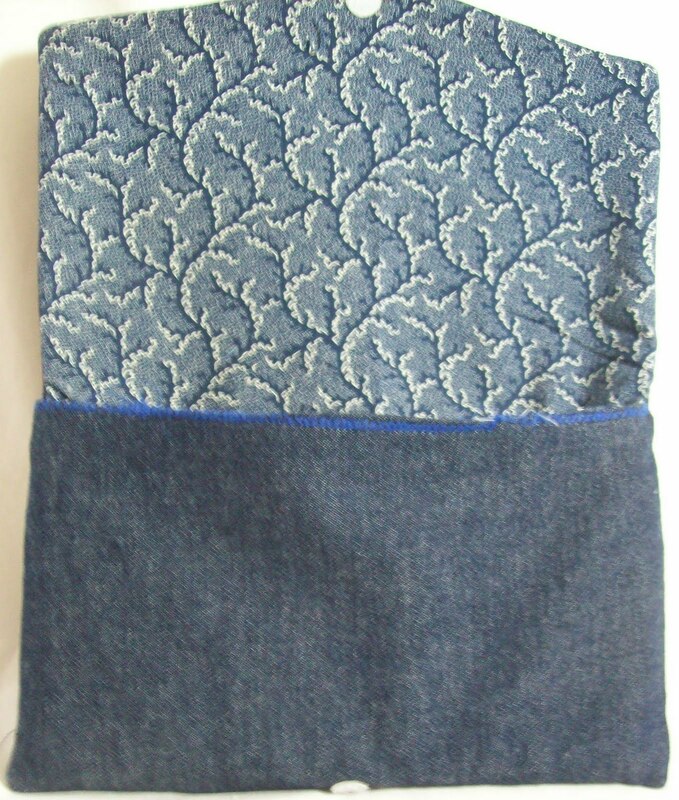 and got some small projects cut and interfaced, and even got a second skirt cut—another denim one—not one of the 4 colored ones I planned last January. And, in a fit of optimism, I even bought a remnant—a lovely piece of a black linen like cloth--(not real linen, but...) and will be able to add a black skirt to the mix. NY'ers have a reputation for always wearing black—but I only have 3 black skirts (and one is over 20 years old, and faded from a real dark black to a pale imitation of black). So adding an other black skirt isn't really overwhelming. 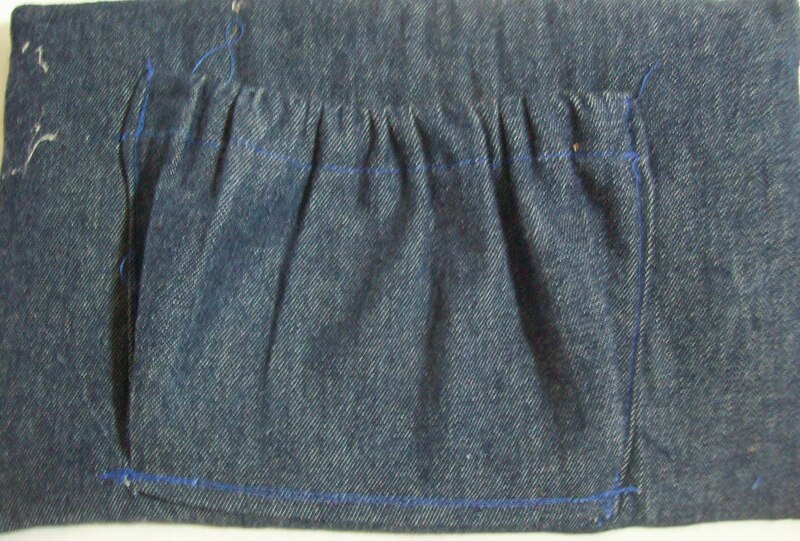 The denim skirt is going to be semi fitted—but also have an elastic waist--(and a drawstring!) so the it will fit as I lose weight. I am am sort of putting off the other skirts—I don't want to make them them and have them not fit 6 months from now Though, actually I will be very happy if I have to make some clothes because nothing fits 6 months from now!--I just don't want to make a bunch of “fit now” skirts when I am (and really planning to) losing weight. Well I have a skirt or two that needs some mending—I'll mend and add some new elastic to some stuff, and hold off till next year to make some new stuff. Not Done!—The thing is they are all knit (done!) but they are not done because they are still on the needles—and will remain there for a few days. They are really wonderful though --(I have, of course, tried them on!) The rib pattern is so soft and cushy—and the the fit-- perfect. The ridges in the rib pattern make the feel so warm and cozy! 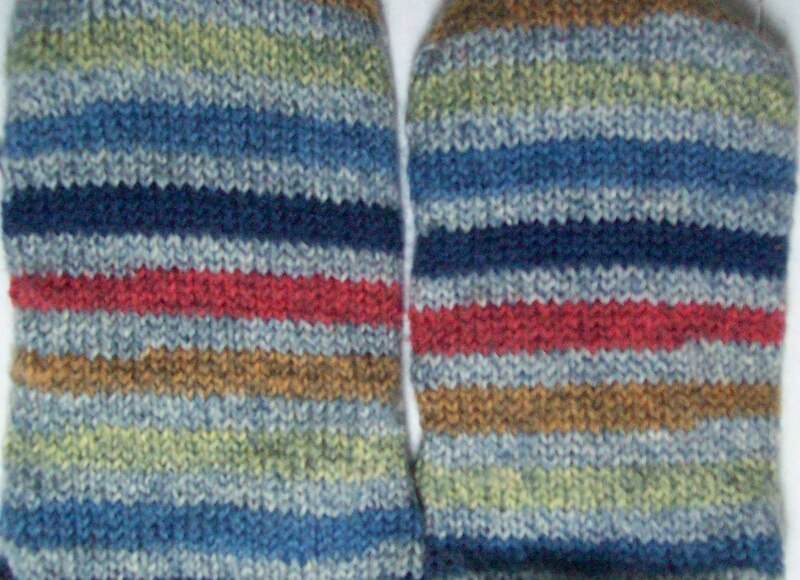 I think I like how the the stripes look on the sole (the plain stocking knit) better than how they look in the ribbed pattern—but, OH, I LOVE how the rib feels! The reason they are still on the needle and haven't had the last few stitches grafted is: My friend D. is completing her first pair of socks--(she started them in July and has been struggling with them—but not ever giving up) and the last lesson she needs is how to graft. SO... I'm holding off till the weekend—and then I'll demo grafting on my socks, and let her try it out on her socks. What Next?--I don't know! Gloves—from the fingers down—are high on my list, and November's socks are already on my mind (these are easy—a pair of lacy socks in shade of lavender!) And last night I balled up some 300 yards of home spun merino is a lovely soft red..its about DK weight—and would make a lovely scarf--(the merino is so soft!) --and I have an idea of what I want to do. 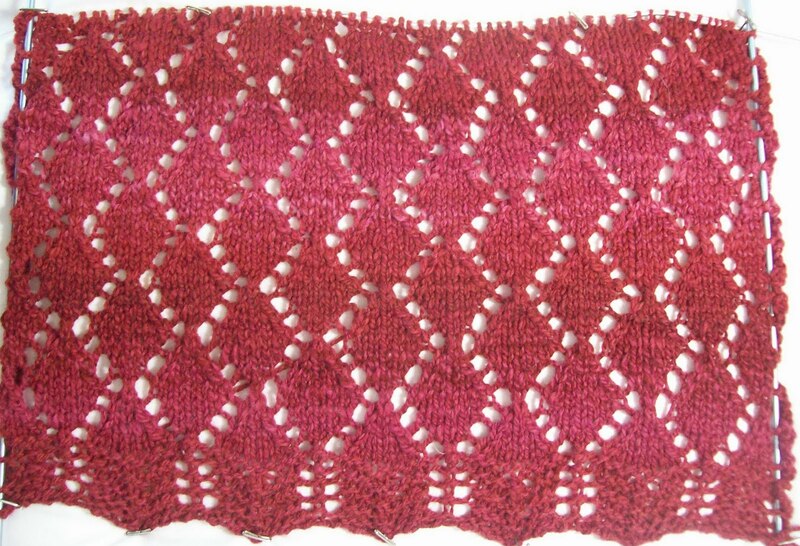 An other rectangular scarf—with broad lacy ends that taper to a simple lace—for most of the scarf. The homespun is in two slightly mis-matched (yardage wise) balls.. It makes sense to start both ends and work them together, and then graft the two halves together—But.. Grand as this sounds—I have at least 3 books that feature scarf patterns (alone!) and another half dozen book with lace patterns—and I am going to at least thumb through them and see if any of the scarves or lace pattens in them jump out and say—ME! You want to knit ME! The paragraphs below might be TMI—so skip them if you are squeamish. In some ways this is the worst! Scabs—work by 'shrinking'--they pull the edges of a wound together (and close it) as they protect the process of skin's growth. The shrinking (and pulling) is an annoying discomfort—It's not so much pain—as irritating.. It's like having a bandage pulling--(you want to rip it off and replace with a more comfortable one!) and it's itchy--(so damn itchy!) too. And its going to take weeks (about 3!) to fully scab up and be a closed wound—Until then, it's dressing (gauze pads) and outer bandage (an ace bandage) to hold the gauze in place and provide some compression (to help the edged come together.) And annoying itch! 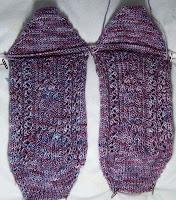 Yesterday saw the socks with the gussets finished—and a few rows of the foot done. I was just starting the pale green stripe. Its complete, as is the golden brown and the red..(which finished one 'color collections”--red was the first stripe after the turn. I will need (judging by the leg) 2 full repeats of the colorway—and a bit more (about half) to finish the foot. The toe will be started somewhere near the next stripe. But there is still a ways to go. Still some progress is better than none—I just can't get my knitting mojo on the right track—I knit, but I dawdle, I knit but..